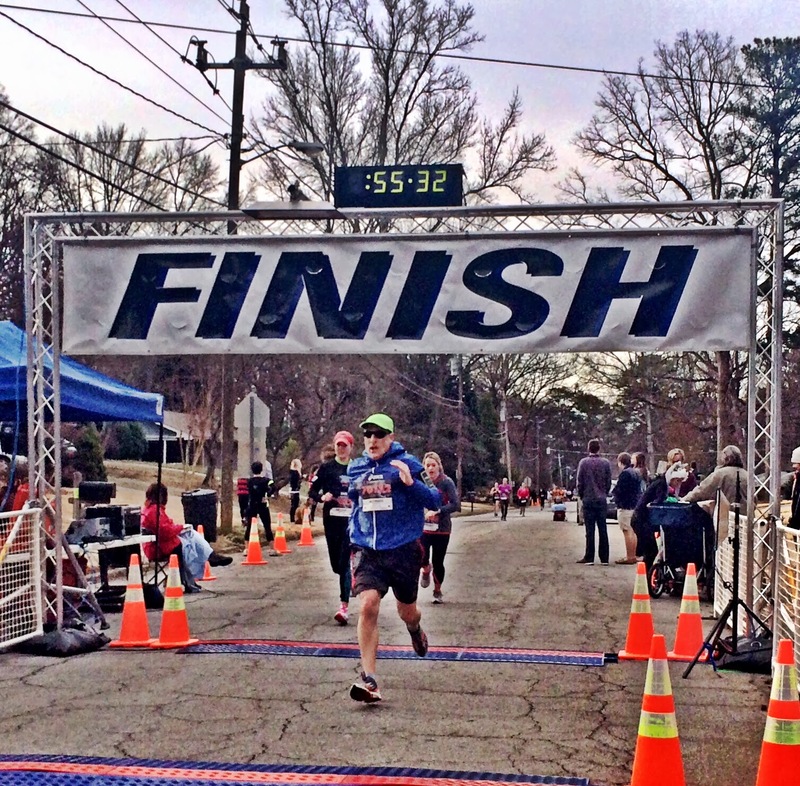 Today’s race was the culmination of my February races: a 10K beginning at Tucker High School near our home, and finishing near Druid Hills Middle School, formerly named Shamrock Middle School. The race was named after a former principal at Shamrock Middle School, who died in 1981 at age 49 from leukemia. His son has organized an annual race in his father’s honor, this year in its 34th running. 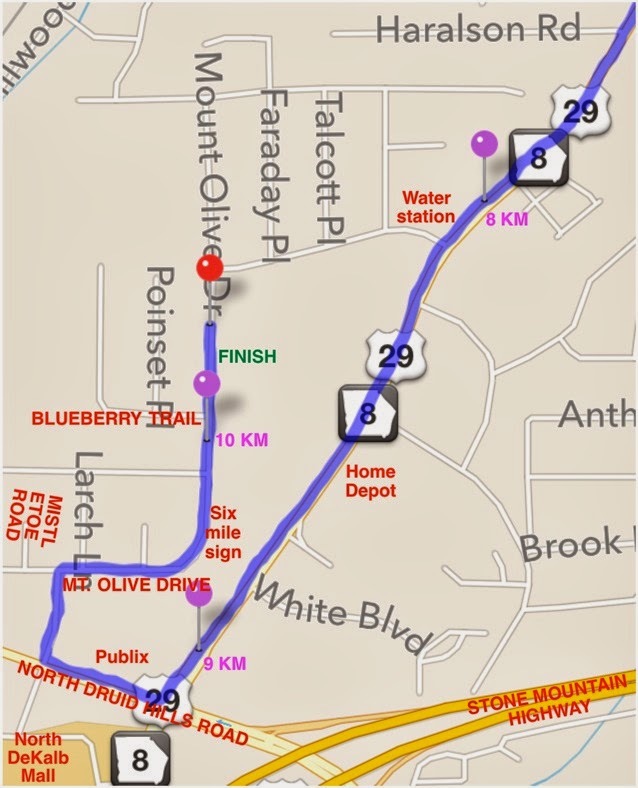 The race had a good rating on Roadraceplace.com, and I was excited to participate in a race near our home in Tucker. 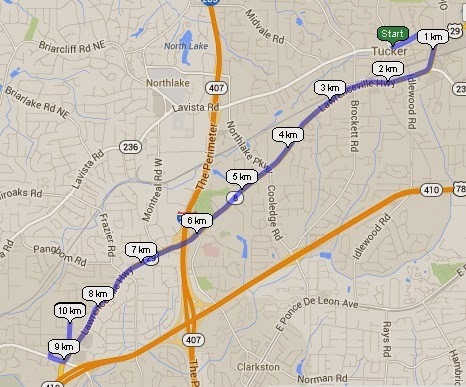 Moreover, I was intimately familiar with the route, as I have driven the section from kilometer 1 to kilometer 9 on Lawrenceville Highway in my daily commute to Emory. The race was billed as a popular qualifier for the Peachtree Road Race (registration deadline in March), and the downhill course as well as the late February timing has undoubtably contributed to its popularity. In my last 10K training run, four days ago at Lucky Shoals Park, I set out to run at a 6 min / km pace for the first five kilometers, with the intention of saving some energy to run more quickly beginning in the later parts of my run. Sadly, the slow start didn’t help, and I just ran more slowly than 6 minutes in the last five kilometers, including an embarrassingly slow 7:00 final kilometer. So I didn’t really have a race strategy for today other than to be aware of where all of the uphill and downhill sections were in the course. Around 7:15 am, Bonnie dropped me off at the county library near our house, a half-hour before the scheduled 7:45 am start, about three blocks from the starting point, and then she headed to the finish area to exercise on her own and wait for my arrival. I was the only person walking to the starting point: everyone else that I saw was running! As I reached Tucker High School and walked to the back of the building where the runners were gathering, I saw a cinder track where quite a few people were warming up by running laps on the quarter-mile oval track. Not to be outdone, I soon joined them, taking the first lap slowly to warm up, then speeding up a bit more in the second lap, on the third lap running at my expected race pace, and concluding with a slower cool-down lap. Hmm, was it such a good idea to run a mile immediately before running 6.22 more miles? I quickly put that thought aside, took a cup of water and sipped it down while walking to the starting area, where a few dozen runners had already gathered. I decided to take a position about 30 meters behind the starting line. As we were joined by other runners, I saw my physician standing with one of his neighbors. I had known for many years that he was a recreational jogger, having occasionally seen him running in my former neighborhood in Druid Hills, near the Emory campus. At my physical exam last year, after I had lost about 25 pounds and had told him that I was starting to run, he had encouraged me to enter the Winship Cancer Center 5K. He seemed pleased to see that I had slimmed down a bit more, and I learned that he is a regular participant in the Charles Harris Run. We were then joined by a half-dozen younger runners, who were apparently some of his students from Emory Medical School. In this race, there were also a few wheelchair racers in the group, some racing on their own, and others pushed by friends. Several people in the crowd were wearing shirts from the Lymphoma and Leukemia Society, and my Dad had appreciated the society’s support when he underwent successful treatment for lymphoma in 2002. Another small group of runners were wearing shirts and even a cape in the design of the Venezuelan flag. So amongst the serious runners, I was glad to see a diversity of other interests represented in the group. As we waited for the start, the early morning sun was shining directly in our eyes. I was one of the few runners wearing sunglasses, but only short sections at the start and near the finish would take an easterly direction. As the race time neared, a few clouds blocked the sun. The start and first kilometer: I checked my position, about ¾ of the way back in the crowd. We received an alert about 30 seconds before the start, I cued up the RunHelper program, the starter’s gun sounded, and the crowd moved forward onto Lavista Road. 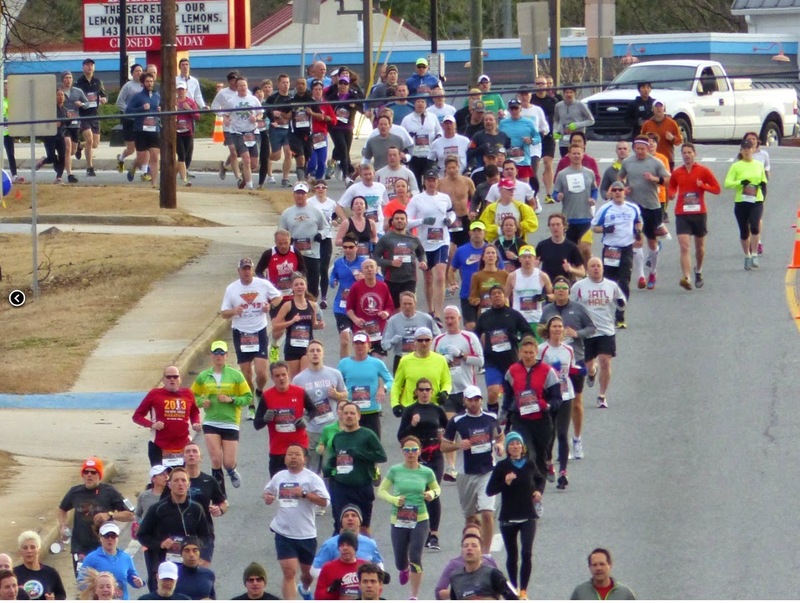 As I crossed the official starting line, I started up the RunHelper program, and was on my way. I found myself working my way around slower runners in front of me. Like a jackrabbit, I was beginning much too quickly, but overcome by the exhilaration of the start, I threw caution to the wind. In the first half-kilometer of today’s race, I was running at a 4:30 per km clip, even though I was working my way around “slowpoke” runners. I was staying to the left of the group, near the center line of the road, as both east-bound lanes were reserved for us. We quickly proceeded to the eastern terminus of Lavista Road, and at the Walgreen’s at the corner, turned onto Lawrenceville Highway. Before I knew it, we had already covered the first kilometer, in 4:45 minutes. The second kilometer: There was a slight rise as the road crossed over the railway passing through downtown Tucker, but I was relieved to discover that the climb was very mild. 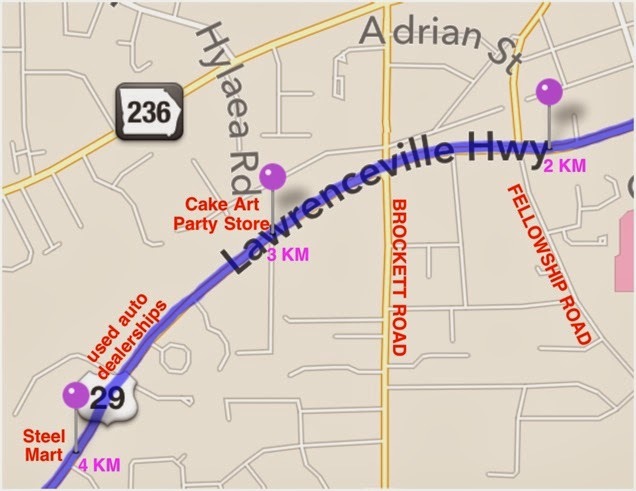 The group of runners then turned the corner past the intersection of Hugh Howell with Lawrenceville Highway, for the long straightaway to the east, toward Decatur and Atlanta. I was running in the left lane of the two east-bound lanes reserved for the runners. As I passed Main Street, my nose was suddenly assaulted by the odor of frying grease emanating from the Burger King. I can’t believe that I used to eat at places like that! The odor was almost nauseating and I was motivated to get away as quickly as possible. The alert for the end of the second kilometer sounded, at 4:44 minutes and 9:29 total elapsed time. If I could only maintain this, I would finish in less than 50 minutes. I'm at the top center of the photo, with the lime green cap, sunglasses, and blue jacket. 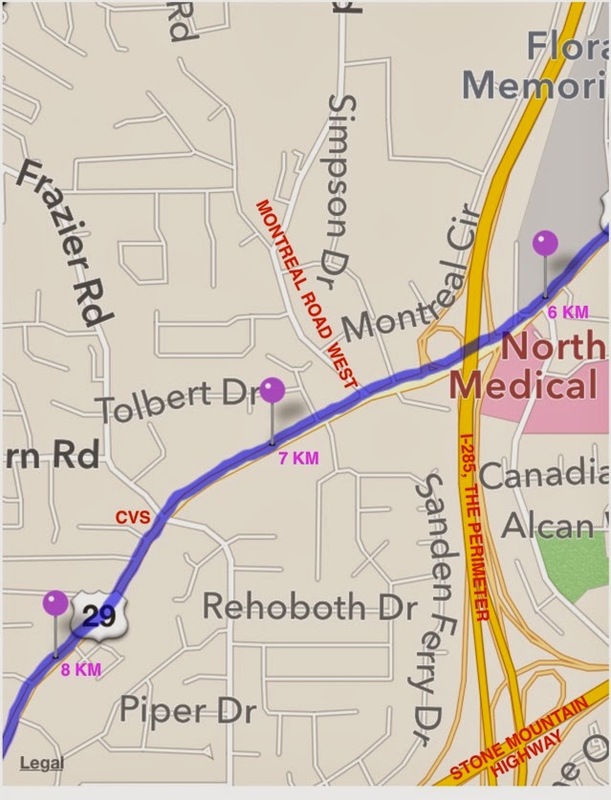 The third kilometer: We ran up a mild rise to the intersection with Fellowship Road. The police were blocking traffic at major intersections, so that we could run through unimpeded. Unfortunately I was already starting to feel the first bit of tiredness. RunHelper sounded an alert of 2.5 km as we approached the intersection with Brockett Road, which I had previously noted as the quarter point for the race. Remembering how I felt at the turnaround point midway through last week’s 5K, and not having much energy after finishing the 5K, I began to wonder if I would be able to finish today’s 10K. But the road began a gradual downhill for a long stretch, and I remembered from studying the map that I had just passed the highest point of the entire route. The 3 kilometer alert sounded as we passed the Cake Art Party Store, 5:12 for the third kilometer and 14:41 elapsed time, still on a pace below 5 minutes per kilometer. The fourth kilometer: This section of Lawrenceville Highway is heavily industrial, especially along the right (northwest) side of the road, with the railway passing behind buildings and warehouses. We passed several used car dealerships. In this section, I found that other runners were beginning to pass me, a few moving significantly faster than me, so I moved to the right lane of the road, so that others could pass me safely. But I feared that some of the “slowpokes” in the first kilometer were now passing me. There were not that many people behind me at the start, so it was statistically likely that some of the runners passing me now are having the last laugh, if they recognized me from the start. I reminded myself that I’m not racing today to win, I’m racing to improve on my previous time of 55:45. So I will just run my own race. The 4 kilometer alert sounded, 5:24 for the fourth kilometer and 20:05 elapsed. Oops, now at a 5:01 minute per kilometer race. The race route now narrowed to one lane. A 50 minute finish would probably be impossible, unless I made up a lot of time on a later downhill stage of the race. The fifth kilometer: Upon passing the Steel Mart at the 4 km mark, I saw an encouraging sign hanging from a street-side mailbox, reading “Run for Love!” in rainbow colors. Several other colorful signs followed, spaced about 100 meters apart, including “I don’t know you, but I’m proud of you.” Thanks to the signs, and perhaps also due to other runners passing me, I picked up my knees a bit higher, and focused on the mechanics of running, trying to keep a consistent pace. At this stage, a woman crossed into the street several meters in front of me, dodging the other runners to get to the cones. I thought that she was perhaps waiting for a bus, but then she joined a wheelchair racer that was pushed by a young woman, and I realized that they were going to run together. We crossed a big intersection at Northlake Parkway (to the right) and Cooledge Road (to the south). A few minutes later I saw that the first water station was coming up on the right, and I moved to the far right of the lane. Although I wasn’t really thirsty, I thought that it would be wise to take a sip or two of water. I slowed down to accept the cup of water with both hands, and then realized that another runner was coming up quickly behind me. He barely avoided plowing into me, and managed to dart around me to my left. I ran slowly for several steps while I took small sips of water, then dropped the cup into the last garbage can as I picked up the pace again. The five-kilometer alert sounded, indicating another 5:24 kilometer and elapsed time of 25:29 at the halfway point. At least I wasn’t slowing down any further. The sixth kilometer: As we approached the funeral home and cemetery, we began a nice downhill stage. I tried to lengthen my stride a bit, but I couldn’t take much advantage of this section. The wheelchair racer and runners were about 10 meters in front of me, in the left side of the lane. Then of course, the road turned upward again, as we approached the perimeter highway, I-285. Some runners slowed, and a few even began walking up this hill, but the woman pushing the wheelchair barely slowed. Here I was appreciative of my hill training, as I was able to pass a few runners in this stage, and maintain a decent pace. 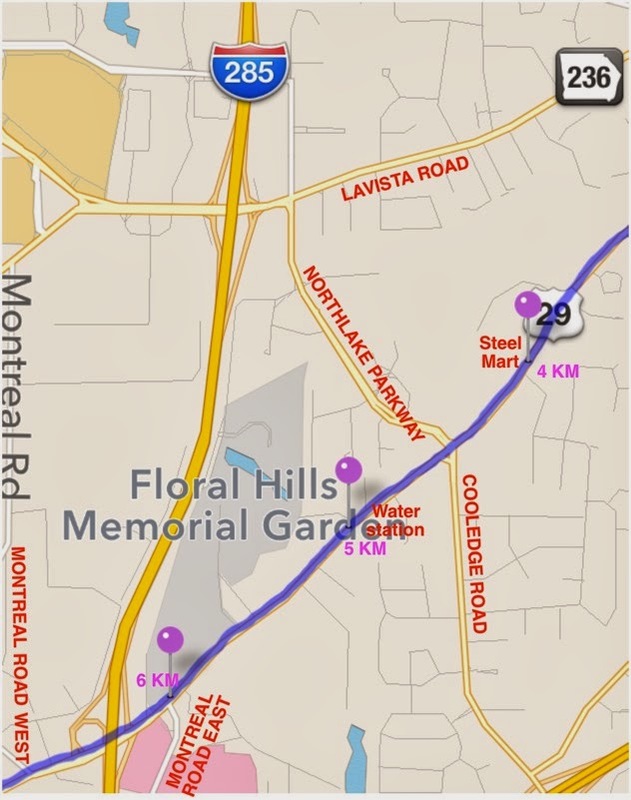 As we reached the intersection with Montreal Road East, the six-kilometer alert indicated 5:32, and 31:01 elapsed. The seventh kilometer: The stage crossing the Perimeter was the last, and perhaps the biggest uphill challenge of the race. However I was able to maintain my pace, and even caught up with the wheelchair racer. Out of respect for the wheelchair pusher’s ability to maintain her own good pace up the hill, I decided to run with the wheelchair racer for a moment instead of deliberately pulling ahead – and I knew that she would probably have passed me anyway on the next downhill stretch. We ran together through the large intersection overpassing the interstate. The police were forcing southbound drivers who had attempted to exit at Lawrenceville Highway to turn around back onto the Perimeter, presumably to take the next exit about one mile to the south at Stone Mountain Highway. As we passed Montreal Road West, the road leveled out. The hardest part of the race was over, and the challenge now was to endure to the end. The seven-kilometer alert indicated 5:56, and 36:57 elapsed. The eighth kilometer: The section was a mild downhill. Unfortunately I was unable to lengthen my stride, so I didn’t manage to speed up at all. The wheelchair racer pulled far ahead, and a steady stream of runners passed me on the left. I mean, they kept coming, and coming. I was going to finish last if this kept up much longer. My momentary joy at reaching the CVS, the three-quarter mark for the race, was quickly tempered by a twinge in my right knee. I had felt this before on occasion in training runs, which had forced me to stop running and walk the rest of the way. That would really ruin my time if I had to walk the final two kilometers, but if the pain grew any worse, I would need to stop running to avoid serious injury. I focused more on mechanics, picking up my knees, and that helped a bit. Certainly the pain didn’t get any worse, and I decided that I could keep going. In fact the road took a slight rise as the eight-kilometer alert sounded, and the change in running mechanics helped the knee, I guess using a different ligament. Even though this stage had been mostly level or slightly downhill, my time for the eighth kilometer was only 5:54, with 42:51 elapsed. The ninth kilometer: The 8 km mark was also the five-mile point, with a clock showing slightly more than 43 minutes. I took a cup of water at the water station and took a couple of sips. I tried to calculate my anticipated finish time although I was so tired that working arithmetic in my head was difficult. Or perhaps I wasn’t happy with my answer projecting a finish time of 54 – 55 minutes. I was still on pace for a personal record, but I wouldn’t be able to move up to starting wave C for the Peachtree Road Race if I didn’t finish in less than 54:00 minutes. I had been looking forward to the ninth kilometer ever since I had first learned about the Charles Harris Race late last year. The long downhill should have truly provided a fast finish. But for me, I simply couldn’t force my legs to move any faster. I couldn’t lengthen my stride. However I did find that I could run a little more easily, even if at a slower pace than I had hoped. But people were still passing me. I probably would have run even slower if it weren’t for people on the sidewalk encouraging me, “Not much further!” and “You’re doing great!” As I approached the big intersection with North Druid Hills Road, the alert sounded 5:42 for the ninth kilometer, and 48:33 elapsed. The tenth and final kilometer: The intersection of Lawrenceville Highway and North Druid Hills Road has a deserved reputation as metro Atlanta’s most dangerous intersection, and in the top-10 nationwide for collisions. I’ve seen the immediate aftermath of two collisions myself. But today it signaled the final kilometer of the race! I picked up my knees as I turned the corner and quickly covered the block to Mistletoe Road. Another right turn onto the shady residential street was followed by a third right turn onto Mt. Olive Drive. There were advertisements for the Intown Ten for next weekend (probably not for me...). A few people who had already completed their race were walking back to the parking area at North DeKalb Mall. Mt. Olive Drive took a broad turn to the left and there was the six-mile sign! Only 0.22 miles to the end. But I couldn’t see the finish line yet! The road was also uphill in this section. Finally, upon reaching the crest of the hill, I could see the FINISH. And it was not nearly as close as I had hoped it would be. I couldn’t even make out the characters on the clock at first, and by the time that I was close enough to read the clock, the time had ticked over to 55 minutes. But I could still set a personal record if I hurried. As I drew within 50 meters of the FINISH, I saw two women ahead and to my right who seemed to be slowing down. But the announcer was encouraging us to finish strong. I mustered my last bit of energy, began pumping my arms and increasing my pace, and quickly accelerated to a fast sprint. A group of men at the finish line, probably working for the race, could see that I was rapidly gaining on the women and cheered me on. I passed them both, with about 10 meters to go, and the clock reaching 55:30! I flew through the finish gate to cheers and Bonnie’s cry of “Frank!” I gave a fist pump and tried to grab my cap to wave it in the air, but it fell off behind me and I ended up reaching behind to avoid dropping it in the road. After the finish: Oh my gosh, I was so tired. I kept walking forward to try to cool down, Bonnie called again, and I turned around and walked back toward her, but kept moving, to keep anything from cramping up, and continued walking up Mt. Olive Drive to Druid Hills Middle School, where the finishers were gathering. Bonnie was so excited with my finish, and she had captured the perfect photo! At the school, I picked up a couple of cups of water and a banana. There were a lot of people who had finished ahead of me, but I finished. FINISHED! I almost forgot to pick up the commemorative technical shirt, but remembered just before we left the school to walk to Bonnie’s car. By setting a personal best, I achieved my primary goal, to improve a little with every race. But I learned today that significant further improvement will require some training with a knowledgeable coach, which I hope to do once the Peachtree training sessions and group runs begin in late April. Goal: To run every kilometer in less than 6:00 minutes: Achieved!